LEATHER THERAPY Restorer won Best Leather Care Conditioner in Michael Plumb's Horse Journal! LEATHER THERAPY Offers PROVEN Results! Quality Leather is not inexpensive, yet many times mold, mildew, dirt and grime are allowed to destroy the integrity and beauty of the leather both in your trucks and on your saddles and tack. LEATHER THERAPY offers an affordable, easy to use, and truly superior line of products to strengthen, beautify, restore and condition your expensive leather products…from saddles, to boots, to upholstery. LEATHER THERAPY® even has a Leather Laundry Solution for Suedes, Leather Truck Interiors, Riding Pants, Sheepskin and other leather clothing. It restores that fresh, soft feel and look…and all in your OWN washing machine! 1999-Independent University Laboratory testing conducted by a major tannery showed that Leather Therapy Restorer and Leather Therapy WASH actually increased the leather strength by 36% and inhibited mold growth beyond even what the tannery could provide. 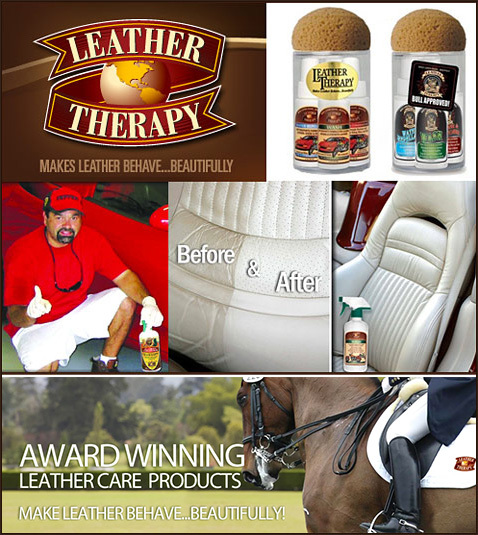 2000-Leather Therapy Restorer is approved by the EPA as a mold & mildew inhibitor in a leather conditioning formula. Our products were formulated to help your customers solve their problems; they're original and they work! LEATHER THERAPY Restorer and Conditioner Restores Your Truck To Best Condition! Our Restorer and Conditioner has won the "Product of the Year" Award. Conditions from the inside out to make leather stronger & last longer. Eradicates mold and mildew problems. Shortens new leather break in period. Leather remains supple and beautiful with increased strength. Non-greasy or sticky. Will not harm stitching or metal. Environmentally sound. Restore that old, dried-out museum piece-easily. Saddle Pad and Blanket Rinse was created at the suggestion of a university professor andverterinarian to reducve the spread of skin problems from horse to horse. Saddle Pad & Blanket Rinse was created at the suggestion of a noted university Professor/Veterinarian. It provides anti-static benefits in a formulation designed to decrease the spread of skin problems from horse to horse. Also reduces the risk of cross-contamination from odor-causing bacteria and molds. Leather Therapy Wash safely & effectively deep cleans even the toughest grime problem without hardening or darkening leather. Concentrated micro-suds lift out embedded dirt leaving leather clean with a wonderfully soft feel. No build up in tooling areas either to worry about. Repels dirt when dry. Environmentally sound. Leather Therapy Water & Soil Protection for leather, suede & nubuck. Protects from water, slush, mud and salt. Will not change color, feel or breathability of leather or fabric. No silicone, waxes, oils or hydrocarbons. Leather Therapy Finish is a flexible, durable, water repellant surface coating for dyed, antiqued or polished leather. Dries to a rich mellow sheen. Can be used on all colors of leather. Perfect for that extra show ring touch or to add zip to shoes. Leather Therapy Laundry Solution both cleans and conditions leather, fabric and sheepskin items in your washing machine! Restore the soft feel of suede or smooth leather chaps and full seat leather breeches and riding pants. Refreshing fragrance. Patent pending. A revolutionary emollient-rich conditioning rinse for natural or synthetic leathers, fabric and sheepskin items. Use directly in your washing machine along with Leather Laundry Solution, then follow as a wipe-on dressing for extra dry leathers. Discover the well-cared-for look and feel of fine riding apparel. Wonderfully refreshing. Patent pending. The SAMPLER contains 2oz. each of Leather Therapy Restorer, WASH, Water Repellant and FINISH. An applicator sponge and instructions are also included. Everything you need to take the very best care of all your leather goods - from saddles and boots to baseball gloves. Order LEATHER THERAPY Products Today! Leather Therapy products can be found at numerous retailers and online catalogs. Your friends at Leather Therapy are happy to help you with all your cleaning and leather care needs. Just call today and we are happy to talk to you!